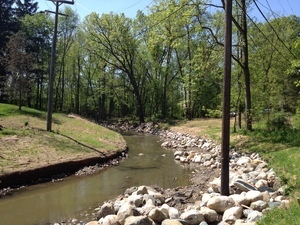 Posted on Wed, May 9, 2012 : 5:57 a.m.
A multi-million dollar environmental restoration project rife with controversy and bad luck has wrapped up in part of the Malletts Creek drain. The county drain is the main outlet for stormwater runoff from the city of Ann Arbor and dumps into the Huron River. After phosphorus loading into the river caused numerous ecological problems - including algal blooms - state officials declared the need for remediation. Washtenaw County officials gave project managers from the Michigan Department of Environmental Quality a tour Tuesday morning at the work sites on the creek south of Washtenaw Avenue near Platt Road and the Washtenaw-Stadium split. Drain Commissioner Janis Bobrin and her Environmental Manager Harry Sheehan escorted Karol Patton, senior project manager for the Malletts Creek work, as well as DEQ project managers Karen Nickols and JoAnn Kalemkiewicz through three sites where the majority of the work had been done. Work began in September to prevent stream bank erosion and lessen the flow of sediments along 1.5 miles of the waterway as a part of an overall plan to decrease phosphorus loading into the Huron River, as a part of a DEQ mandate. The plan, approved in 2000, did not account for the ban on phosphorus fertilizer imposed by the city of Ann Arbor in 2006. Improvements to Mary Beth Doyle Park, completed in 2008, effectively reduced 25 percent of the phosphorus in Malletts Creek, Sheehan said. 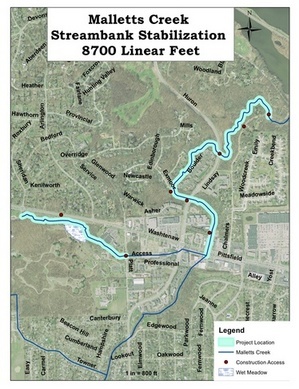 The $2.8 million project is funded by a grant from the DEQ and a revolving loan from the state -- which will be paid back at a 2.5 percent rate over 20 years using funds from the stormwater portion of city of Ann Arbor water bills, Sheehan said. Mead Bros. Excavating, which secured the contract for much of the work done on the project, suffered a blow in December when an accident left an employee dead. The small company - of which many of its employees are related - was rattled after Wayne Mead was pinned by an excavator while working on the restoration at the County Farm Park on Platt Road. Though initial reactions from area residents at public meetings held on the project were negative, Bobrin said she believes public perception has turned around. “This park was a hidden gem,” Bobrin said. Embankments that were once steep - causing a narrow, fast flow in the drain that swept sediment straight into the river - are now more gradual. Non-native tree species and acres of invasive honeysuckle bushes have been removed. Willow and dogwood cuttings have been planted along the banks of the drain. Sections of the drain have been bolstered with rock, and diversions have been created to prevent further erosion of embankments. Sheehan said the way the water is now flowing through the creek bed is promising - the current is carving a new route through the channel, depositing once-troublesome sediment. A portion of the Malletts Creek drain by Exmoor Road. The utility pole in the photo used to be on the embankment - but erosion washed the soil away. Diversions have been created in the creek bed to structure the flow of the current for a portion of the drain by Exmoor Road in a residential neighborhood where homeowners watched their rear property lines erode into the drain. Instead of sending water into the severe bend of the creek where it would carve away sediment and carry it downstream, bands of large boulders - termed “rock veins” - channel the water into the center of the creek. Part of the drain at the County Park has been engineered to be a new, three-acre storm water detention wetland that will collect sediment once it is fully operational. While newly planted vegetation takes root, a steel wall will keep water out of a lowland. Within several years time, Sheehan said the wall would be cut open to allow water to flow into the area. The wetland is designed to collect sediment in one of its first pools - which will require periodic dredging, Sheehan said. The sediment collection basin is part of the overall efforts to keep dirt - which contains phosphorus - out of the Huron River. 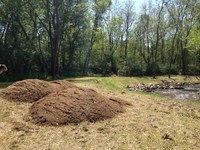 Piles of sand along the Malletts Creek drain near Chalmers Drive have been dumped for turtle habitat. A native seed mix has been spread across the restored area at the County Park adjacent to Washtenaw Avenue where the wetland has been created. A new pedestrian access point to the County Park will be created from the multi-use path that runs along Washtenaw Avenue. Though some complained that the removal of the trees and brush - which Sheehan acknowledged was a clear-cut activity - a prairie has now been created that Sheehan said will be maintained through controlled burns. Sheehan said regular burns will help keep invasive species out of the prairie. Along the creek several piles of sand have been placed to serve as turtle habitat. Amy Biolchini covers Washtenaw County, health and environmental issues for AnnArbor.com. Reach her at (734) 623-2552, amybiolchini@annarbor.com or on Twitter @amywrites_. Thu, May 10, 2012 : 1:32 p.m.
Great project. Mosquitoes don't breed on moving water - this will help. The creek is still a floodplain - a pth next to it would undoubtedly wash out at some point. Geez - Doesn't anyone in Ann Arbor have SOMETHING good to say about ANYTHING? Wed, May 9, 2012 : 9:51 p.m.
Thu, May 10, 2012 : 3:47 a.m. Yes, TreeTown, Mallet's Creek does run through Sheffler Park and northward roughly along Huron Parkway until it crossed under Chalmers Dr. and then empties into the Huron River approx. at Chalmers and E. Huron River Dr. You can see it (some of it) using Google Maps, especially the part which visibly starts at I-94 and then creates the collection pond at the W. edge of Mary Beth Doyle Park. I believe the Huron River Watershed Council has a complete mapping, including branches and parts which are completely underground in storm drains. We learned back around 1990 that one branch runs from the parking lots at Briarwood. That's the reason the creek has had so much fouling from parking lot runoff. 176 years ago, the entire creek was wild and open with only one landmark on the 1836 postal map: Mallet's Landing - which was located far South of where I-94 now runs. Thu, May 10, 2012 : 2:10 a.m.
Is that the creek tha runs through Sheffler parK? The one in this story feeds into it, correct? I hope kids are still catching crawfish out these creeks. Its a shame you can let your 8 year old go wandering around aimlessly catching things away from home anymore. Thu, May 10, 2012 : 1:27 a.m. Wed, May 9, 2012 : 10:47 p.m. Thanks for relaying this delightful information. Wed, May 9, 2012 : 7:26 p.m.
Now the fox will have to be very crafty when they venture down to the water for a drink. Wed, May 9, 2012 : 5:36 p.m.
Nice pictures. Glad I can't see that from the road. Otherwise I may end up in it. Great job. Wed, May 9, 2012 : 4:58 p.m. I have to say the restoration along Washtenaw looks pretty good, plus we're really looking forward to using the new entrance that has been created there to access the park and our commmunity garden. Wed, May 9, 2012 : 4:15 p.m. Wed, May 9, 2012 : 4:29 p.m. Thank you for bringing that to my attention. I've fixed it on my end -- the changes should appear in the story soon. Wed, May 9, 2012 : 4:25 p.m. So they meant for it to keep flooding like it did two months ago? Wed, May 9, 2012 : 1:54 p.m. Living next to Mary Beth Doyle Park, I am grateful for the time and money spent to make this park one of the most beautiful parks in Ann Arbor. One can walk and see natural plants, it is a bird sanctuary, deer, rabbits just come out of the woods ...it is peaceful. The frisbe golf is distracting, but the visitors are respectful and keep the park clean. The basketball courts are in use most of the time and the playground is clean and inviting. The path around the pond is great for walking or biking. Wed, May 9, 2012 : 1:52 p.m. Wed, May 9, 2012 : 10:44 p.m. Thank you for this information which helps me understand and appreciate the project more. Wed, May 9, 2012 : 1:31 p.m. I understand why people think that &quot;substantially complete&quot; is confusing because of the way the creek looks now. I think what officials mean by that is that the stormwater remediation portion is nearly done. Clearly, the vegetation has not yet filled in and it looks very incomplete at the present time. Plants take time to grow and removal of all the invasive species and replacement with native species WILL make this area look like a gem in the future. Instead of impenetrable thickets of invasive buckthorn and honeysuckle that serve no ecological purpose at all, there will be a prairie which will be ablaze in color in two to three years. The wildlife it will attract will be awesome with butterflies and other insects that will attract all kinds of birds. So, in addition to improving water quality of a river from which we all drink, these so-called dumb officials have been quite smart to take the opportunity to restore habitat that will also enhance the aesthetics of the creek. We need to stop watching so much TV in which all problems are solved in 30 minutes and understand that nature takes a little time. Thu, May 10, 2012 : 1:42 a.m.
Drew, I couldn't agree more. Brad, you are very short-sighted. Wed, May 9, 2012 : 1:34 p.m. Nature, some rip rap and a bunch of Caterpillar equipment you mean. Wed, May 9, 2012 : 1:11 p.m. I just walked through there last week and it didn't look all that &quot;complete&quot; to me. Plus you can really hear the road noise in the park now. I'm also concerned about mosquitos in the summer with the extra water surface area. Seems like a lot of work on a little creek. As far as &quot;restoring&quot; it, I grew up in that neighborhood and used to play in the creek as far back as the 1960s and all it ever looked like was a little creek. Wed, May 9, 2012 : 7:23 p.m. I spent many of my childhood days all over Washtenaw Woods. They should have built a replica of that old wooden bridge that crossed over the creek on the northeast corenr of the property. Wed, May 9, 2012 : 12:48 p.m. Presumably, the trees will take a while to mature, at which point the park will be less &quot;open to washtenaw&quot;. Wed, May 9, 2012 : 5:45 p.m. Wed, May 9, 2012 : 12:18 p.m. This article was almost unreadable. Hopefully the author will try harder next time. Wed, May 9, 2012 : 9:02 p.m. It read like a fifth grade book report. Wed, May 9, 2012 : 12:27 p.m.
&quot;Multi-million dollars&quot; to Gaia, instead of the hungry and homeless! Wed, May 9, 2012 : 2:45 p.m.
From your comments on other sites, as well as this one, you seem bent on insuring there will be increasing numbers of 'hungry and homeless&quot; via the overpopulation you clearly encourage, along with your obvious distain for the idea that we are a part of a wider web of life/nature. Wed, May 9, 2012 : 12:14 p.m.
to quote the article: &quot;This park was a hidden gem,&quot; Bobrin said. Well, it USED to be a hidden gem. It's now a &quot;wide open to washtenaw&quot; gem. While I agree it is important to keep our river healthy, it would have been nicer for County Farm Park if a buffer of vegetation between Washtenaw Avenue and the North edge of the park had been kept. It used to be hard to tell, while walking in County Farm, that you were so close to the busy Washtenaw commuting/shopping areas. It was a peaceful walk. Now you can watch the traffic go by. Wed, May 9, 2012 : 1:38 p.m.
Vegetation takes time to grow. Pay it forward. Wed, May 9, 2012 : 12:05 p.m.
What? Complete? I walk the County Park 3-4 times a week and have been watching the progress. The explanation about the project said that all the trash trees that were removed would be replaced with native trees. I expected hundreds of replacement trees. The creek bed was supposed to be lined with decorative rocks. I expected a walking path to follow the winding path of the creek so that walkers could enjoy its beauty. There will not be a new walking path? I am hugely disappointed. Wed, May 9, 2012 : 4:24 p.m. I'm hugely disappointed because the very same creek that doesn't have &quot;decorative rocks&quot; and a walking path and &quot;hundreds of replacement trees&quot; floods my property at least once a year. I would like to trade lives with you. Wed, May 9, 2012 : 11:35 a.m. I would be nice if the map was inter-active. Wed, May 9, 2012 : 3:10 p.m.